Not too long ago I approached a natural health clinic asking them about their cleaning needs. The clinic supports holistic medicine and is home to naturopaths, chiropractors, osteopaths and registered massage therapists focusing on natural and holistic remedies. Having a similar approach with our green cleaning products, financial support of charitable projects and focus on social responsibility, I thought our ideologies were compatible. The receptionist was lovely and very interested in the idea of supporting those in need, but when she checked with the clinic owners, she found out that their current cleaning service charges on a per hour basis 30% of what we do. I was shocked. The clinic was openly admitting that they pay a cleaning service less than minimum wage to clean their two-storey clinic. I warned them of the mathematics behind a price that low indicating that it is highly likely their service's employees are being trafficked to work for free. The receptionist agreed with me, but that was as far as she could take it, as she received orders from above. Unfortunately, this story is not uncommon. In many instances, cleaning services illegally don't pay their employees and keep them motivated by occasional cash bonuses. Illegal immigrants take these jobs so that they can stay in Canada and pay their bills (if only once in a while). They work long hours and don't receive any of the protections of the Employment Standards Act like sick leave or breaks. It's an illegal underground network of unpaid workers (a.k.a. slaves) that have no other choice, or are threatened with deportation by "employers" (a.k.a. masters). This is a classic example of human trafficking and exists right here in Toronto. A step up from that situation is when employers consider their employees "freelance contractors". This is an underhanded tactic employed by some of the largest companies (the famous-for-their-branded-car-company included) as well as the shifty low-cost operators. By classifying employees as freelance contractors, a company can offer an employee 18% of the price of the job. If the cleaner does the job fast enough, then they can do another job and make more. They are also charged for the operating costs of the company like using the company car and supplies and equipment (and cleaning of the supplies and equipment). After all of the hidden fees and costs are removed from their paycheque, an employee makes far less than minimum wage and has no protections under the Employment Standards Act like breaks, paid travel between jobs, CPP, EI, holidays, sick leave, maternity leave, severance etc. Many people take these jobs because they have no other choice, but our labour laws were put in place to protect people in exactly these situations. 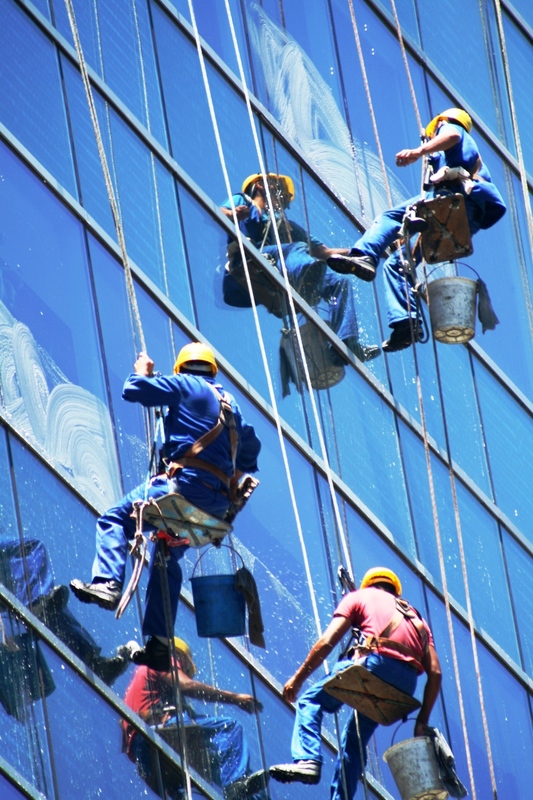 After the recession, many cleaning companies were forced to go out of business and those that didn't, adopted these practices which have now become the industry standard. This article in the Toronto Star illustrates a common exploitative situation for downtown building office cleaners. A company wins a contact for office cleaning, then subcontracts it to a cheaper service, that then subcontracts to an even cheaper service that subcontracts to individual people who aren't paid for their work. When the workers want to complain about their lost wages, they have no one to hold accountable and the end client can keep their hands clean by claiming they know nothing about the practice. One could argue that with prices that low, you should know. If the prices seem too good to be true (like $10/hour), it is a sure bet that the money is coming from the worker putting all of the time and energy into the job and not from the middle man. And if the employee is disgruntled, the standard of quality is lowered substantially. The client no longer receives the quality they expect and then the situation becomes unsustainable. When wages under minimum wage become common practice, it is incumbent upon the consumer to make the educated, sustainable decision. If clients started asking "Are your employees considered employees or contractors?" and "How much per hour do they make?" these practices would disappear. But if the job price is the only consideration when comparing companies, then this predatory industry practice will continue until the labour laws adapt. No one should be allowed to agree to a freelance contract that pays less than minimum wage. A law stating this would protect those most at risk and prevent eventual industrial collapse.